Back in June, we reported that Britain’s Revolution Software and adventure gaming auteur Charles Cecil were gearing up to make a new game in their Broken Sword series. Turns out those rumors were true: Revolution opened a Kickstarter campaign on Thursday raising funds for the development of Broken Sword: The Serpent’s Curse, the first entry in the series since 2006’s Broken Sword: The Angel of Death. Unlike Angel of Death, Broken Sword 5 will return to the rich 2D animation of the earlier games in the series. Artists that have worked with Nickelodeon, Disney, Dreamworks, Sony and others are going to provide the visuals for Broken Sword’s first original HD outing. Veteran voice actors, including Rolf Saxon who voices lead George, will return for the new game. Speaking of George, he and his constant companion Nico are once again caught up in a Parisian mystery in Serpent’s Curse. It all starts with a stolen painting but the adventure becomes a “race against time as dark forces from Europe’s turbulent past are woken from their slumber.” Sounds like Templar trouble to me. Revolution is aiming to raise $400,000. As of this writing, the campaign hasn’t been open for 24 hours and it’s already raised nearly $110,000. Broken Sword: The Serpent’s Curse is just the latest point-and-click adventure success story on Kickstarter. Al Lowe’s Leisure Suit Larry rebirth raised $650,000 in April. Gabriel Knight creator Jane Jensen raised $435,000 in May, funding three games including Moebius in the process. 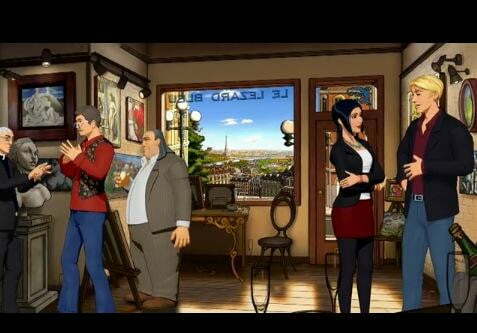 It’s great to see Broken Sword back in action, especially hand animated rather than as a polygonal game like Angel of Death. Something from Revolution’s world is lost when rendered in the third-dimension.